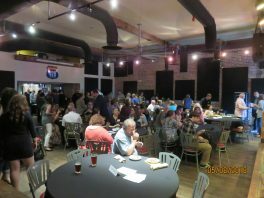 A standing room crowd filled the event space on the second floor of Barley’s Taproom in Downtown Maryville Tuesday night for the inaugural “Sky City Initiative” meet-up. “We had 100 pre-registrants and another 27 who registered at the door,” Rachel Buchanan, Director of Economic Development for the Blount Partnership, told us. Her organization was one of the sponsors, and the attendance greatly exceeded expectations for a first-time event focused on helping support entrepreneurs in Blount County. That message – what can we do to ensure a robust start-up scene in a county that is already doing so well in growing its manufacturing sector – was underscored by Storm Taylor, the well-known producer of shows like The Wild and Wonderful Whites of West Virginia documentary. He’s a native of Maryville and graduate of Heritage High School who recently returned to his hometown to raise his children. While Taylor will continue to travel to New York City and Los Angeles several times a year to produce videos, he’s also putting the finishing touches on a business in Downtown Maryville. It’s an upscale pub and bar called Saint Taylor’s Public House. His professional life that has taken him to many parts of the country and his most recent experience in starting a new venture served as a backdrop for the key points Taylor made in his brief, somewhat irreverent but impactful presentation. Taylor also harkened back to earlier days when the section of Broadway in Downtown Maryville had so much foot traffic with multiple department stores, smaller shops and a couple of movie theaters. That’s certainly not the case today, but it is something that Taylor believes entrepreneurial ventures like Saint Taylor’s Public House can bring back. In fact, he believes it is almost an obligation for others to pursue. 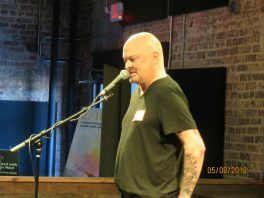 Prior to his presentation, Jesse Labelle, a Nashville-based musician and songwriter, entertained the group with several songs including one that won him an award, and Lane Shuler of LeConte Realty wowed the group with an inspiring presentation that you would have needed to see and hear to fully appreciate the motivation and inspiration he provided. In addition to Buchanan and Shuler, other members of the organizing team include Claire Carter, Blount Partnership; Kenneth Herring, Cirrus Insight; Bob Hirche, International Center for Minimal Access Surgery Inc. and also the Downtown Maryville Association; Jeremy LaDuke, Epic Nine; Christy McDonald, Maryville College; Renee Ritchie, Feed the Orphans; K.C. Williams, Blount County Public Library; and yours truly. 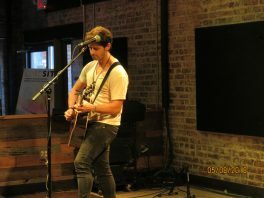 In the photos below are Labelle playing his guitar and singing, Taylor making his inspiring presentation, and the crowd that filled almost all of the seats and lined the walls of Barley’s Taproom.